“Indie Game: The Movie”, directed by Lisane Pajot and James Swirsky, gives a look at the world of independent computer (XBOX360) game developers, and what makes them tick – as they ramp up for a show in Boston. These mostly are “informal” young men with loose social connections. Some say they have their backs up against the wall. If they don’t get their games working and make a decent result at the show (in terms particularly not only of official reviews and sales but Facebook Likes) their future “careers” are over. One is a diabetic and is shown injecting himself, but still wants to make enough to help his parents pay off their house. There is something familiar but disconcerting when one of the gamers says that if he doesn’t make it, his life is over and he will kill himself. People either succeed or fail in his world. When they fail, they disappear forever. Everyone is on his own, without many real-world social connections (although the men do have teams and little companies, and some have girl friends, and particularly attentive cats, which never seem to damage the computers). This was the most striking point of the movie. One of the developers explains how his game, “Super Meat Boy”, is supposed to work. The character has no skin, and be killed by a spray of salt. He explains how the player learns the game. At the show in Boston, “Peter” has to constantly fix his game, Fez, as it freezes when real users try it. This may be one of the first films where the “visuals” consist of heavily indented java code. It's worthy of note that none of the games seem to be violent. They seem to involve imaginary characters that evoke some sympathy from the players. I wondered how gaming programs compare to chess-playing programs, which normally have run on super-computers, to play at an international level. I wondered how good the games that emulate fantasy baseball or football work. Is there a game that can replicate in detail all the physics of pitched and batted baseballs, allowing for different stadium outfields? 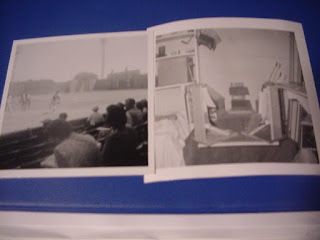 When I was a boy in the 1950s, we invented pinball-type baseball games to be played in cardboard stadiums. I could think of other ideas. Imagine a game set on an extraterrestrial planet that is tidally locked and where only an annular ring (in perpetual twilight) has a climate mild enough for the characters to live. Or imagine my screenplay. A guy like me is abducted by “angels” and taken to a space-station near Titan. Both the “angels” and “me” need each other to “survive” on our own terms, as the Earth back home is on borrowed time. That sounds like an idea for a game, doesn’t it? I shouldn’t give too much away. The film website is here. The film (BlinkWorks Media) showed at Sundance. A comment was accidentally placed on wrong blog, and rejected. I think the comment belongs here on this film. "The choice of map and game mode is usually controlled by the server administrator. You can normally play all kinds of games on other peoples' servers, but hosting your own gives you and your friends direct control. Clans (clubs of gamers who often play together on teams) often choose to run their own servers, making it possible for them to hone specific tactics in specific settings. The main advantage is that server administrators can control who plays on their serves, so a clan will be able to get all its members together at once and makes sure they get to play together in specifically chosen teams. RAID stands for Redundant Array of Inexpensive Disks. These are usually used in place of hard drives in case of server computers. The primary aim in case of RAID is to make data transfer faster and to store many copies of the same data so that it remains available even when one of the hard drive stops functioning. A Rift Private Server will also offer easy ways for you to get great weapons which may be very expensive to get on an official rift server. The server will do this by lowering the price and increasing the drop rates as well as increasing the upgrade chances if applicable. This lessens the time you spend gathering money and/or grinding for a level when playing on a Rift server. truly bother anyone, it's a distinct approach to play minecraft. The complete game is played out on the display screen of the personal computer. The game, mainly because of the flashy screens and layouts, would seem considerably more relishes on line. These servers will often have their own game items to offer to their players. These game items could well be completely different from what is offered on an official server. A private server will often offer them as cash-shop items (or donations) in order to feed their bottom line. Dedicated servers are generally setup on a remote server (i.e. The server is not in the same locality as the gamers). Usually, this server will be part of a data center, which is a facility which contains many servers for various purposes."